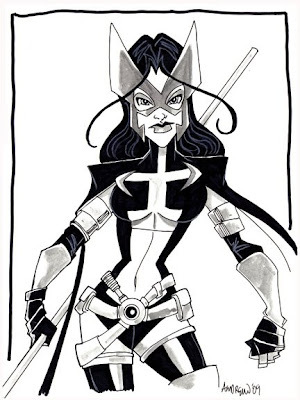 One more for today... Huntress, Jim Lee design. This is a classic Batman villain that a lot of fans are probably not aware of. For what I understand of the story, this was the Joker before he became THE Joker. This one is Robin for the 90's. 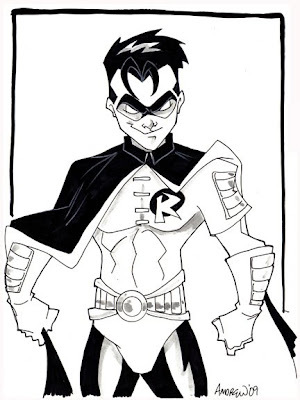 A little different from the current Robin and a little younger too. 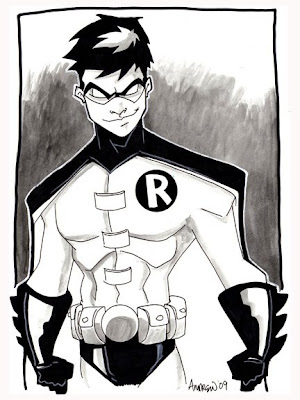 One more for tonight... Robin in his new costume. Ok, just started doing some drawing again and here is another one for Lee... 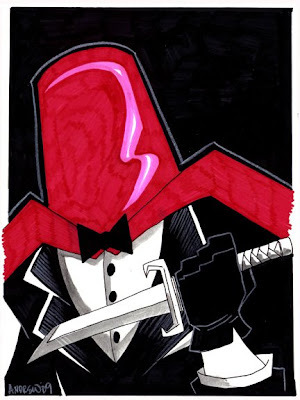 The Penguin. The first step is the sketch. A rather rough and just a place holder for where everything should go. The second step is light pencil. no real detail just blocking out the image. Step three is the blacks. With these drawings I am doing a lot of black and white negatives and step four is the white outlines and shading. Then a little gray tones... and done. 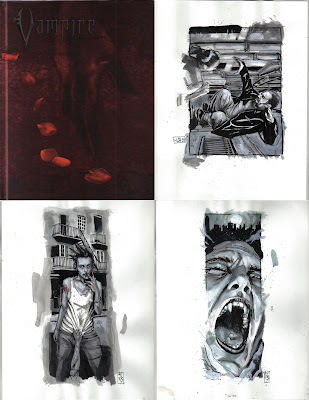 The first is a set of 3 illustrations from the VAMPIRE the REQUIEM gaming book (pictured and included in the auction) from White Wolf. Months and months ago, my daughter and I switched rooms. She took over what was my office and I moved my office into her bedroom. Last week, she asked if we could switch back. The wife was not happy about it but I was kind of expecting it... eventually. We started Friday night and finished all the big stuff this evening. Whoa. I still have to clean out the closet but my drawing table and computer table are completely set up and her bed and dresser are all in place. I still have to go through all the CRAP in my room and organize everything else. Pictures will be coming soon. Any one gonna be in Miami June 5-7? Why not stop by the Florida Super Con and see me. I'm driving down and gonna do the show all three days. 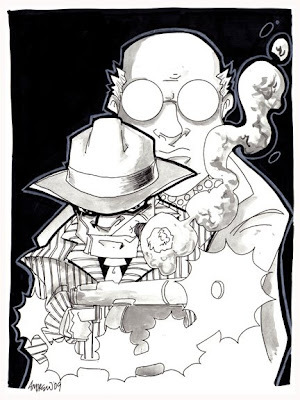 At this point, I should have my con buddy Wayne Cordova (creator and writer of M.I.M.E.S.) in tow. I've never been to Miami and look forward to checking out this show and possibly making it one of my annual convention stops (along with Mega Con and FX Con). OK. I took another stab at the Balcksmith and I'm like it even better. I want to do a more stylized animated style for this project and I think I'm getting closer here. I need to do two versions of the Smith, this would be his younger version. The other would be 12-13 years later. He'd still be big and strong but maybe a little plumper. I'll take a stab at that next. This one I nailed almost on the first try. In the opening chapter of this new story we introduce the Blacksmith. The Smith is a very large and strong character who is also quite gentle and caring. 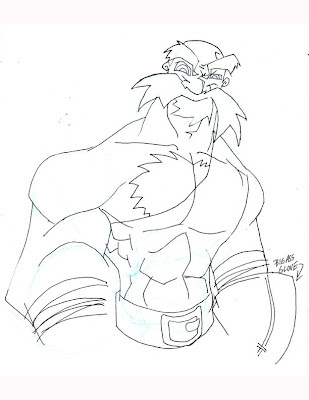 His role is extremely important in setting up the story and the catalyst that begins our hero's journey. 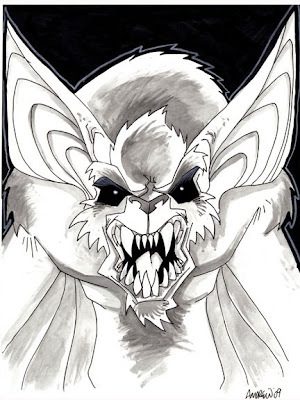 Another Batman villain for the Batfan... The Ventriloquist. I guess you can consider this a "process" piece. 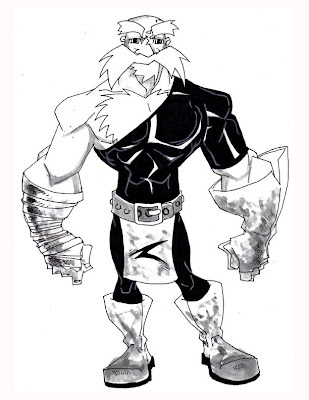 A new story idea I am working on starts off with a wizard character. he only appears in the first few pages of the story and I don't think he appears again but I want to get him right. The first take was... close but not enough. The second was much, much closer and the third was almost there... almost.